Six-part BBC comedy thriller written by and starring James Corden and Mathew Baynton. 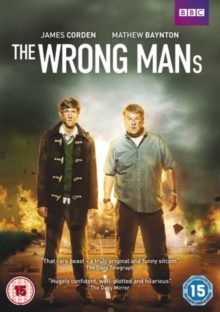 Council employees Phil Bourne (Corden) and Sam Pinkett (Baynton) become embroiled in crime and conspiracy when Sam answers a ringing mobile he finds at the scene of a car crash. When their identity is mistaken Phil and Sam find themselves in danger, wanted by both criminals and the authorities. The cast also features Emilia Fox, Dawn French and Dougray Scott. The episodes are: 'The Wrong Mans', 'Bad Mans', 'Dead Mans', 'Inside Mans', 'Wanted Mans' and 'Running Mans'.